This post might make you squeamish, but if you’re like me you passed that point a long time ago. There’s nothing worse than sticking to the BRAT diet when you love food (bananas, rice, applesauce, toast), and there’s a limited amount of “safe” eating guides out there. So I thought my pain could be your gain, by sharing what I’ve eaten on the road to recovery from stomach troubles. Oatmeal is a good choice and Malt-O-Meal with a drop of maple syrup is delicious (no milk, sorry). Bananas are the first letter in the BRAT acronym, but make sure they are nice and ripe to cut down on acid. When you’re ready, scrambled eggs with salt and pepper (avoid butter). TriscuitsEdit are satisfying and the texture is a little more exciting than saltines. Tortilla chips (without salsa) are a safe bet, especially for dining out. Toast with olive oil or honey (no butter). Brown rice or white rice: I purchased the microwave-ready kind for convenience at work, but cooked the rice in a ceramic bowl with a little water instead of the packaging (personal preference). 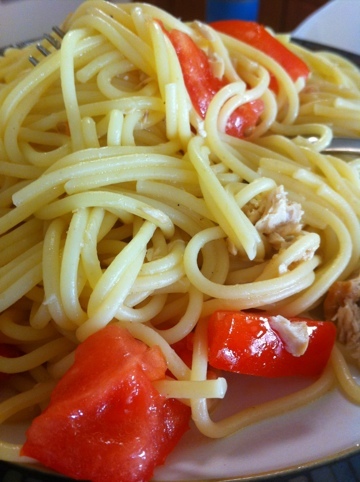 Add canned tuna or chicken if you have the appetite – or stick to salt, pepper and soy sauce. Ramen with mild (not spicy!) broth; you can purchase Annie Chun’s Soup Bowl, but only use a small drop of sauce. Canned tuna with olive oil instead of mayonnaise, on bread, crackers or rolled up in a tortilla and sliced into pinwheels. When you’re ready, ease into sandwiches that don’t have mayonnaise or veggies (i.e. turkey, chicken and cheese worked okay for me in the later stages). At home, I made either rice or pasta and ate it plain or with olive oil, salt and pepper. When I was ready to add meat, the safest bets are white meat: chicken, turkey and pork. For me, beef is too hard to digest. Taco shells filled with ground turkey (cooked in its own juices, seasoned with salt and pepper), plus rice. At restaurants, menus can be intimidating. I found that roasted chicken was usually the best choice for me – not perfect – but better than other options and usually served with mashed potatoes. Skipping the salad or appetizer course is hard, but ask for a second bread basket to keep you from making a desperate move. See more BRAT-friendly dinner ideas here. I drank water with most meals and in between. (Smartwater and coconut water have electrolytes!) For me, juice and soda are too acidic. I eased back into adult beverages with beer, but made sure to combine it with food and lots of water. Don’t rush it until you feel ready though. Godspeed my friends – and please share your own stomach safety tips in the comments section below.